Not many places in Cairo, outside of five-star hotels, can boast a blend of pub and restaurant. Most pubs are short on good quality food, and most restaurants do not serve alcohol. Tia Maria is good on both fronts; for those who enjoy a drink, especially an interesting cocktail, and those who like to indulge in a good three-course meal, with or without alcohol. Located at the heart of ‘good old days Dokki’ on Jeddah Street, off Moheddine AboulEzz, Tia Maria is on the ground floor of a three-storey apartment building; many of these charming low-rise buildings have survived the architectural bleed of the once-quiet residential neighbourhood. 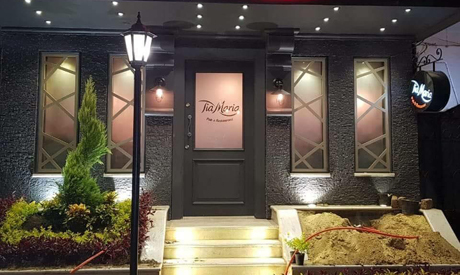 The interiors of Tia Maria are as welcoming, simple and alluring as the entrance. The establishment offers good appetisers ranging from sambousaks to mini-shawermas and mini-burgers, as well as a good selection of wine, mostly local. However, the herring salad, served with or without tahini, could be considered the top contender for Tia Maria’s best appetiser. A nice selection of appetisers, cold and hot, with a bottle of wine could keep the evening going from the time Tia Maria opens at 7pm until a little past midnight when the band starts. Another round of finger food and drinks can then keep you going until Tia Maria closes at around 4am. There is also the appealing alternative of drinks, mussels and French fries. The menu boasts the “Belgian moules et frites” as Tia Maria’s special. The quality of the moules et frites is quite good; however, the real treat is having a restaurant at the heart of the city that can serve mussels and fries with a diverse selection of drinks. Despite the loud chatter, music and the inevitability of heavy cigarette smoke, Tia Maria is a good option just for dining, provided that customers are alright with stools and high tables. After all, the lighting is not too dim. The selection of main dishes is diverse and the food is of high quality. A particularly successful plate is the salmon steak, which is filling enough with its side orders of fries and vegetables as to make appetisers unnecessary. Soup and pasta, or salad and pasta, are equally good alternatives, with satisfactory quality and sufficient portions. All the above speaks well of Tia Maria, although the limited selection and the quality of its dessert section leave something to be desired. After all, a pub-restaurant is no destination for dessert addicts. Tia Maria is not exactly inexpensive, but neither is it overpriced. On weekdays, it is alright to arrive with a large group without needing a reservation, but for weekends it is wiser to call and reserve.